Okay, so the majority of my trip to Quilt Market was actually spent wandering around in a bit of a daze surrounded by ridiculous amounts of fabric and more quilts that you can ever imagine. Whoa. 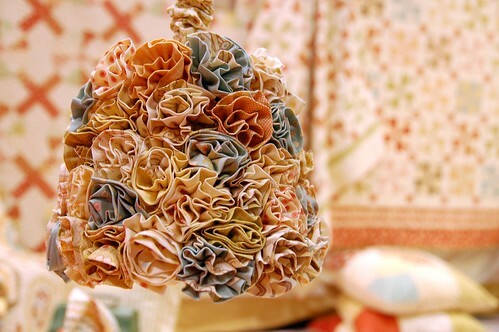 For someone who loves textiles, it’s definitely sensory overload. Let me start by explaining exactly what Quilt Market is. It’s a huge trade show for the quilting industry that happens twice a year. The fall show is in Houston Texas, while the spring show moves around from city to city. The spring 2010 show will be in Minneapolis. The first part of quilt market is to the ‘trade only’ and all the fabric manufacturers, designers and distributers have booths where they show off all their new collections. The booths are usually filled with quilts, accessories and clothing made up from the fabrics and you can sit down and look through all the collections and place orders for your shop. Sewing machines, notions, quilt patterns, books and magazines are also represented. You would not believe all the sewing gadgets, accessories, and even lotions and potions that are represented. I was surprised to see several vintage dealers who sold fabrics, quilts and even buttons and jewellry. I treated myself to a sweet pink vintage feedsack and a few yards of an old orange floral fabric. There is also a Quilt Festival that happens right after Quilt Market and this is open to the public. There is a huge exhibit of vintage quilts, along with quilts that have been entered into competition. The lighting was pretty awful in the convention centre and especially in the exhibit, but I tried to get photos of my favourites. It’s fascinating to see all the different types of techniques that are used in these modern quilts, including all kinds of hand painting, beading and photo transfers. Since I was hanging out with the Soak gals, I got to tag along to their meetings with some of the designers. I got to meet (and secretly gawk at) Amy Butler, Anna Maria Horner, Heather Bailey, Joanne Figuerora, and Sandi Henderson. Each of these talented ladies were so incredibly sweet and I was just blown away with the new amazing collections and patterns they have come up with. You can be sure to find lots of their new stuff coming to the workroom a.s.a.p. I was especially charmed by Anna Maria Horner’s new line of flannels for kids – FINALLY, flannel prints that are modern and not too cutesy. 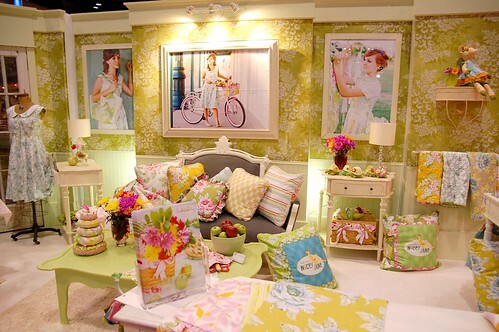 Heather Bailey won for best booth design at the show and it was well deserved. I loved her wallpaper, clothes line and she even had real sod laid out. Check out her cute new patterns – Henrietta turtle and Claira & Clancy pig dolls. I can’t wait to get them in the shop. There were so many independent quilt pattern designers at the show, but the one that stood out for me was Carolina Patchworks. In particular her Another Brick in the Wall and Golden Waves seemed like super fun quilts to make. I picked up four of her patterns for the shop and can’t wait to try them out. I told you before I left that I had two missions – Japanese fabric and felt. Sadly I didn’t discover a good source for felt, but I hit many home runs on Japanese fabrics! I made great new contacts and ordered some unbelievably awesome Japanese prints. I was so excited about them that I completely forgot to take photographs of them, but this way you’ll be surprised and delighted when they arrive. I do have a sneak peak for you of my favourite find – Puti de Pome. I ordered quite a few of these prints including this sweet map fabric, these cars and this border print. Of course, I also ordered some of the new echino line. I tried not to go overboard, but it was really hard. To sum up all that – great food (not counting the convention centre food), quilt mania, inspiring designers and new fabrics and lots of J-A-P-A-N-E-S-E cuteness on the way!! Looks like you had a wonderful time! Thanks for all the great pictures! Oh, I’m so glad you got some japanese prints. Please post when those come in! I need to make a trip to get some for sure. Thank you so much for your report and pictures. 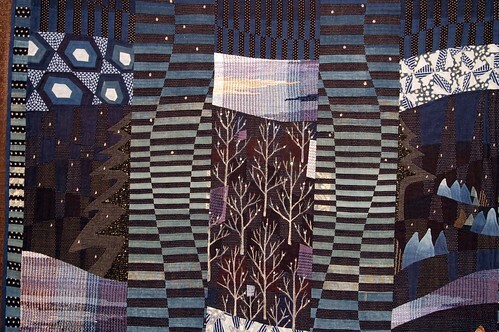 I’ve been thinking that a trip to this Quilt Show is something I need to do. The powerful technique and variety must be amazing to see in person. Thanks for posting these pics…I got all crazy just looking at them. How do you keep your wits about you actually walking around that show!? Also, thanks again for the pulling my name for one of the prizes at your very nice anniversary party on the 13th – it was lovely! 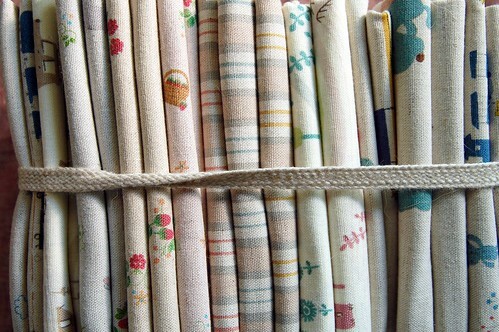 …dreaming of all your new fabric! so so jealous. can’t wait to see the new goodies when they arrive. ohmygosh i freaked out too. everything looks so awesome and the japanese fabric is way way too cute. i’m looking forward to seeing your orders in the shop! woah! I love the muted colors of the fig tree stuff, the flower bed mosaic-style quilt, and and and… so much fabric wonderfulness! crazy! You may already know about them, but if you’re looking for beautiful felt you should check out Fitz Felt http://www.filzfelt.com/ They are from Germany and the stuff is beautiful. ok, that ‘time’ quilt just blew my mind! thanks for the photos, so great to see.